Affinity Logoset v2-01Created with Sketch. The best platform to manage your opportunities and leverage your network to find your next big deal. Use Affinity lists to manage all your opportunities and customize lists to best align with your workflow. 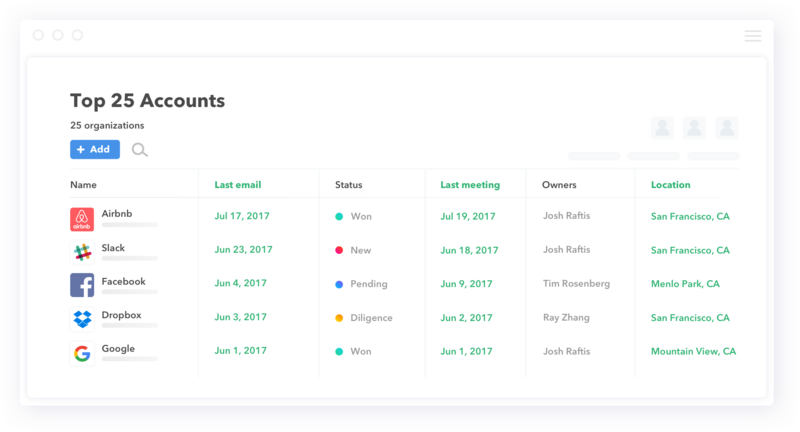 View everything from which member of your team is the last point of contact with a connection to what the next follow-up activity is. With Affinity’s Smart Columns, you will save more than 80% of the time it takes traditionally manage a pipeline, allowing you to get back to closing more deals. Affinity Alliances™ allow you to connect with your advisors, mentors, board members, friends, and investors and gain instant visibility into everyone they can provide warm introductions to. Leverage your real-time network to break into your next largest accounts. Writing a one-off welcome, promotional, or FAQ emails can be time-consuming. Affinity allows you to send multiple personalized emails to prospects with the single click of a button. You can also track when these emails are opened to know exactly when to reach out again. Remembering to update statuses, add opportunities to your CRM, and follow up regularly with important relationships can eat away your time for selling. Use Affinity to set smart rules to automate the repetitive and time-consuming parts of your workflow. Rules such as “If we don’t talk to these prospects every 2 weeks, please set a reminder to follow up” can be activated instantly. Never drop the ball on an important email from an important prospectagain. 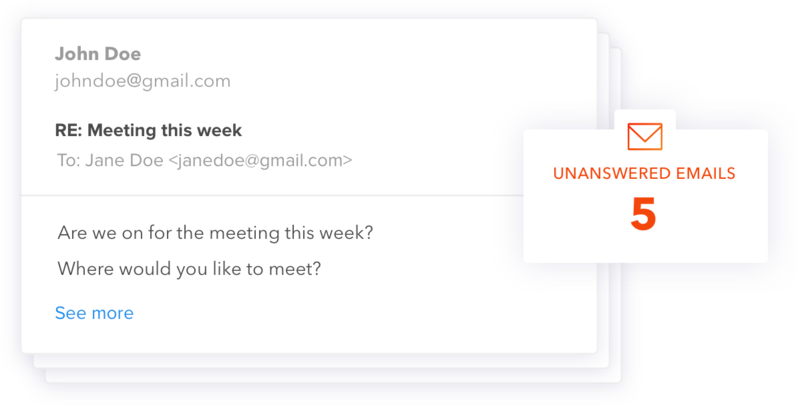 Using machine learning, Affinity proactively identifies emailsyou’ve missed or haven't received a response to. You can also setsmart rules that prompt you to follow up with a prospect after acertain time if they aren’t ready to buy just yet. How many deals has your team closed in the past month? How long is your team's sales cycle? How many new deals is your team creating every week? 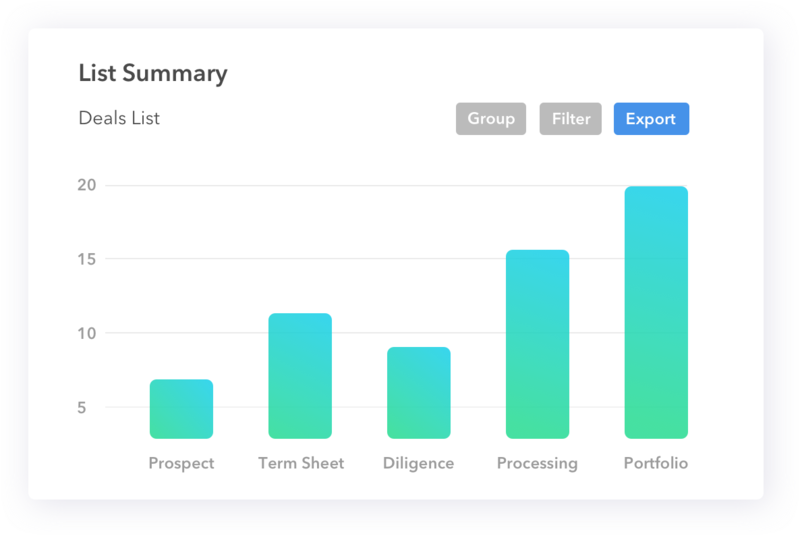 Answer any and every question about your team’s performance using Affinity's sleek reporting. 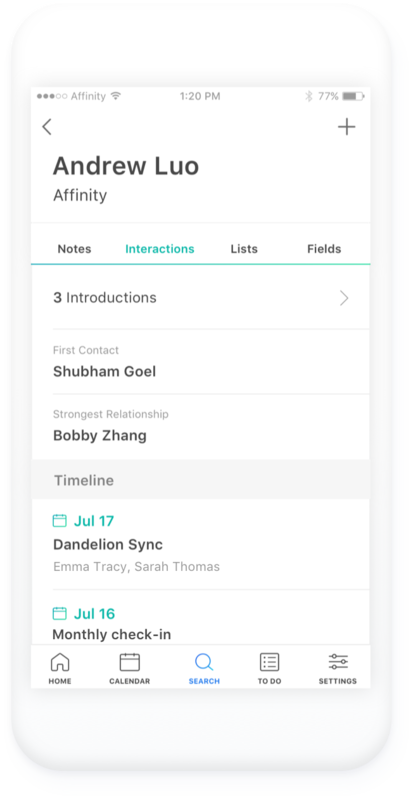 Affinity allows you to close deals wherever you work, whether in Affinity’s list interface, your email, or your mobile device. It takes less than a minute to get setup with Affinity. Chat with our sales team today and start leveraging your network to find your next opportunity.